This city in California is a vital component of the Los Angeles metro, and home of Whittier College, and a semi Mediterranean Climate which makes it a vacation destination. The scenic historic district consisting of Philadelphia Street and Greenleaf Avenue among others is a great place to sample a historic California city. 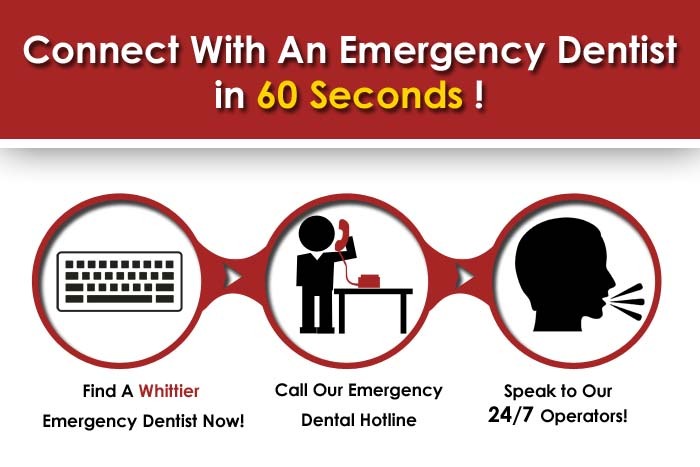 Our portal is the best place on the web to locate an emergency dentist in Whittier CA , if your stay is affected by an aching tooth or need for an extraction. Our vast network includes compassionate dentists nationwide, and Whittier is absolutely included in that network. If you are unable to reach any of these dentists right away, don’t hesitate to call our hotline that is a referral service for a Whittier emergency dentist , especially if you encounter bad luck in the dental realm after hours or on Sunday. There is definitely no need for you to suffer the inconvenience that late night tooth pain puts upon you, because the sensitivity to hot or cold may be a bad sign of dangerous infection. This bustling California city of around 85,000 is where you can visit landmarks such as Rose Hills Memorial Park, The Whittier Museum, and The historic Standard Oil Building. These after hours dentist are vetted by Emergency Dentists USA, and will provide you top notch service if you are put in a painful spot by the onslaught of severe tooth pain. We don’t want you to have to suffer unnecessarily if you are here to go surfing or check out nearby areas like Santa Monica and Huntington Beach; and would love you to put our portal to use and find immediate relief. Description: California is full of things to do that you cannot do in many of the lower 48, and is an amazing place to vacation and sight see. If you encounter severe dental pain during your visit, you can call 24 hours a day and 7 days a week to get linked up with a weekend dental clinic that fits your schedule better than simply standard daytime hours. When pain sets in and you want to see the crashing waves instead of crash in the couch in misery, we’ve got you covered. Description:The best thing about La Habra dental is that they are open 7 days a week! A rarity these days to find a walk in emergency dental clinic that is convenient, courteous, and always there to assist you immediately. Head Diane Lee, D.D.S. Is the creator of the “healthy smile and no cavities club” for children, and a local favorite practitioner with a caring and compassionate touch. Adrian Acosta, D.D.S. Is a paid speaker for Dentist Implant Devices, and Deka Laser certified as well. Description:For a well rounded and professional dentist that is open on Saturday, Asmath’s practice is a well renowned choice for your after hours dentist needs. From cracked teeth to root canal needs and any of the other numerous dental mishaps that you and your family may run into, she’s truly a traveler with information gleaned across the entire globe. He schooling in Bangalore, post graduate studies in oral cancer, and membership in the American Academy of Laser Dentistry all qualify her outright to service you when you require a dentist open on the weekend. Description:With a bilingual staff and years of experience in performing emergency dental procedures, Dr. Trinh received his dental degree at the University of California, and previously attended California State University Los Angeles. An individual who feels that continuing ed is one of the most important staples of his business, he is known to provide service that patients know comes from an inner spirit of true compassion and yearning to comfort those in dire pain. This beautiful California metro area has excellent attractions for the whole family, like King Richard’s Antique Center, Pico Pico State Historical Park, and one of the coolest farmer’s markets in the nation. We would be thrilled for you to use our portal to locate a 24 hour dentist Whittier CA . If you want to officially check the backgrounds and reports of any of these dentists before scheduling, you can visit The California Dental Association.